These are exciting and frustrating times for fans of Fedor Emelianenko. Reports have surfaced through most major media outlets that the Russian heavyweight is again a free agent, causing many to speculate just what has become of the M-1 organization that was being built on top of his accomplishments. This picture can be considered a visual representation of Emelianenko's career as of late: a lot of sitting idly with a huge legacy slipping off of his shoulders. Announced in October of last year, M-1 Global was an interesting but ultimately risky and doomed-to-fail prospect. While fans were simply excited about the potential for the much-revered Russian to fight again, many of us were ultimately skeptical of the idea that you can build an organization on the shoulders of one fighter. Although no official statements have been made, it is clear that internal struggle between the US and European offices of M-1 are likely the cause of Fedor’s current return into the free market. It does not bode well that M-1 has yet to announce a fight card since their press conference last year. 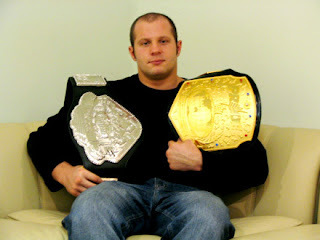 The question now for fans is the same one posed after the downfall of Pride: what now for Fedor? The highly public negotiation process with Zuffa last year did not end amicably, with Dana White calling Fedor’s management “crazy Russians” and Fedor’s camp stating that White is not someone they want to work with. If Fedor were to enter the Octagon, he will likely not be facing Randy Couture anytime soon as the former UFC champ is wrapped up in litigation with Zuffa. Fedor will be entering a rather anemic division fronted by a champion he has already defeated twice in Antonio Rodrigo Nogueira. Aside from a fight with former champ Tim Sylvia, there is little of interest in the UFC for the Russian. Fedor signing with Zuffa also prevents a matchup with one of the few qualified heavyweights that he has yet to fight: Josh Barnett. Dana White has stated several times that he is uninterested in even tabling an offer to former UFC champion Barnett. Anything is possible when money is involved, so it will be interesting to see how negotiations go the second time around. Fedor’s prospects of fighting top competition are even more grim outside the UFC. EliteXC is still searching for top heavyweights while building up their star prospect, Kevin “Kimbo Slice” Ferguson. Kimbo is perhaps several years away from qualifying for a legitimate bout with Emelianenko, but in divisions lacking top contenders this does not mean it won’t happen sooner. The rest of the talented heavyweights are strewn about the MMA landscape and it will be difficult for Fedor to find consistent competition. What this comes down to is the rapidly diminishing legacy of one of MMA’s most dominant fighters. MMA is a sport like most others: it is a confluence of money, power, politics, and athletic talent. As the quest for true mainstream acceptance continues, it will indeed be a shame if these elements cannot come together to give us the fights we all want to see.